The Inter-American Commission on Human Rights (IACHR) recently published its merits report in a case concerning the 1988 extrajudicial killing of Colombian human rights defender Valentín Basto Calderón, which has gone unsolved. See IACHR, Merits Report No. 45/17, Case 10.455, Valentín Basto Calderón et al. (Colombia), 25 May 2017. Bystanders Pedro Vicente Camargo, who was also killed, and his daughter Carmenza, who was injured, were also included as victims in the petition to the IACHR. At a time of armed conflict when State agents and paramilitaries frequently assassinated human rights defenders and community leaders, State agents had threatened Basto Calderón and harassed his family members. The State then failed to conduct a thorough and timely investigation of the events. See id. at para. 1. The International Justice Resource Center (IJRC) submitted an amicus curiae brief to the IACHR to provide supplementary analysis on this case, with a focus on Colombia’s obligations specific to human rights defenders. 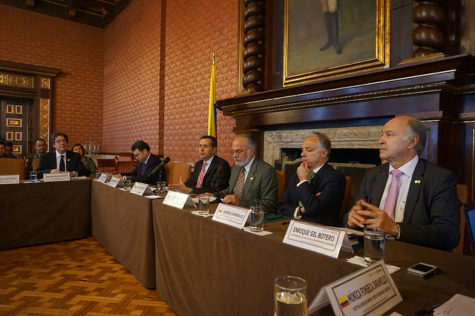 The Colombian Commission of Jurists represented the petitioners before the IACHR. In holding Colombia responsible for violations to the rights to life and humane treatment, among others, the IACHR took special note of the State’s specific obligations to protect and respect the rights of human rights defenders. In August 1989, the IACHR received the petition alleging violations of the rights to life, personal integrity, fair trial, and judicial protection under articles 4.1, 5, 8.1, and 25 of the American Convention on Human Rights, respectively. See id. at para. 2. On July 12, 2010, the IACHR published its admissibility report and found the claim admissible for alleged violations of those articles. See id. During the merits phase, the IACHR also consider articles 11, 16, 19, and 23 (rights to personal dignity, to freedom of association, of the child, and to participate in government, respectively) of the American Convention as they are applicable to the facts and evidence presented. See id. at paras. 114-116. The IACHR held a hearing on the matter in March 2002, issued its merits decision in May 2017, and recently published the merits report. The IACHR began its analysis by determining that it would consider the actions of non-State actors as well as the actions and omissions of State actors, in view of the fact that Colombia had created a general atmosphere of risk – including by establishing paramilitary groups – that increased its obligations to protect individuals or groups from known, immediate threats posed by private actors. See Valentín Basto Calderón et al. (Colombia), 25 May 2017, para. 124. The IACHR found it relevant that threats and harassment preceded the death and injury of the individuals and took place in the same location as the attack on the victims. See id. at para. 126. Further, the presence of paramilitary groups in the area where the attack took place warranted heightened obligations for the State to prevent and protect the individuals who were victims of the attack. See id. at para. 127. Because the work of human rights defenders is intended to benefit society, the IACHR found, an attack on a human rights defender is also an attack on other human rights defenders and society at large. See id. at para. 129. Taking note of the right of human rights defenders to defend and protect human rights as provided for in the United Nations General Assembly Declaration on Human Rights Defenders, the Commission determined that States have an obligation to create conditions that allow for the free exercise of these activities and to not interfere with human rights defenders’ work. See id. at paras. 130-31. The right to defend human rights has also been recognized by the Inter-American Court, as well as by other human rights bodies. See id. at para. 131. The IACHR’s merits report cites to an IACtHR decision that provides that States have obligations to take necessary measures to allow human rights defenders to freely carry out their work, protect them against attacks when they are threatened, to refrain from impeding their work, and to seriously and effectively investigate violations against them. See id. at para. 132. The Commission noted that these obligations to human rights defenders may implicate the rights to life, personal integrity, freedom of association, and judicial guarantees and protection, and that an act of retaliation against a human rights defender may involve multiple violations of rights. See id. at para. 133. Given the fact that Basto Calderón was engaged in denouncing human rights violations and was a social leader, publicly promoting human rights, the IACHR found that the State had an obligation to take the measures that were necessary and appropriate to protect against violations of his rights as a human rights defender. See id. at para. 136. The IACHR held that Colombia is responsible for the violations of Basto Calderón’s rights. In the months preceding his death, there were accounts of threats and intimidation by Colombian police forces and the army towards Basto Calderón, who was recognized as a leader of a social movement and critical of both the police forces and the army. See id. at paras. 138-37. The resulting implications for Basto Calderón’s moral integrity and psychological state were, the Commission found, attributable to the State due to the actions of State agents. See id. at para. 139. The IACHR found evidence of omissions by the State, including lack of timely police response even with a police station nearby, and a departure from a routine check that would regularly take place at the time and place of the incident, which the Commission found, implies the State collaborated in the acts of the unidentified persons. See id. at para. 142. Finally, after his death, there was at least 25 years of impunity and lack of appropriate judicial action with respect to these events. See id. at para. 144. Based on these facts, the IACHR concluded that Colombia violated Basto Calderón’s right to life and right to physical and mental integrity under articles 4.1 and 5.1 of the American Convention. See id. In the related situations of Pedro Vicente Camargo, who was also killed, and his daughter Carmenza, who was injured, as bystanders during the same incident, the IACHR found that Colombia was also responsible for the violation of their rights under articles 4.1 and 5.1, and Article 19 (rights of the child), respectively. See id. at para. 147. Pursuant to Article 11 of the American Convention, the Commission found that Basto Calderón’s right to personal dignity was violated due to threats and harassment, including statements from the Army that he collaborated with guerilla leaders. See id. at para. 150. The Commission found this particularly harmful in this case because it undermines his credibility and reputation as a human rights defender. See id. at para. 149. In view of Basto Calderón’s work, the IACHR analyzed his rights to freedom of association and to participate in government pursuant to articles 16 and 23 of the American Convention from the perspective of State obligations to prevent interference with the work of human rights defenders and to take affirmative steps to ensure that human rights defenders can freely carry out their activities. See id. at paras. 165-66. Basto Calderón’s killing, the Commission found, silenced his criticism and prevented him from participating in government, and, the Commission further found, the State failed to adopt appropriate measures to ensure Basto Calderón’s right to association and right to participate in government as an elected representative. See id. at paras. 170-71. Thus, the IACHR found Colombia in violation of articles 16 and 23. See id. at para. 171. The IACHR, finally, assessed Basto Calderón’s right to a fair trial under Article 8 and right to judicial protection under Article 25 of the American Convention. See id. at paras. 172-73. The IACHR in its decision referenced the IACtHR jurisprudence that has established the rights of individuals to obtain judicial clarification of violations through the process of an investigation and prosecution in the domestic court system following the investigation. See id. at para. 174. The IACHR merits report also cited to the a statement from the UN Office of the High Commissioner for Human Rights that considered the greatest risk to human rights defenders to be impunity for violations against them. See id. at para. 175. Accordingly, the Commission held that Colombia has an obligation to carry out a serious and effective investigation. See id. at para. 189. The facts indicate that judicial orders were not complied with and there was testimony indicating obstruction of the evidence. See id. at para. 191. Given the 25 years of impunity after his death and lack of effective judicial measures to clarify the events, the IACHR found that Colombia violated Basto Calderón’s rights under Article 8 and Article 25. See id. at paras. 190, 192. For more information on the Inter-American System, right to life, humane treatment and personal integrity, and civil and political rights, visit IJRC’s Online Resource Hub. Read the amicus curiae brief submitted by IJRC on IJRC’s website (in Spanish).